User definable keyboard labels go on top of keyboard keys so you can convert the keyboard to another layout. Clear protective label set included to go on top of user definable labels to protect image. User-Definable Beige Keyboard Labels - The user can write their own text on the label. 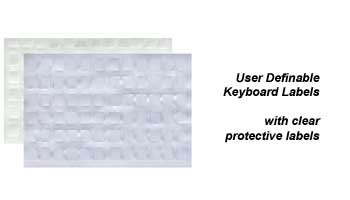 The User Definable Labels includes 72 beige labels and 72 clear labels that fit standard keyboard alphanumeric keys, The clear labels go on top of the beige label to protect the writing from wearing off. DataCal keyboard labels are designed to fit desktop and laptop computer keyboards.